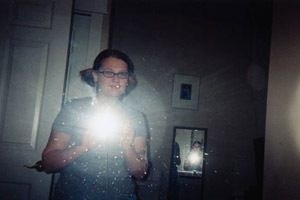 the night before my friend and i went to a party and brought a disposable camera along. we only took about 10 pictures so i was trying to use up the rest of the film. i've taken a real liking to photographing myself in the mirror lately. i think my self-portraits are much more descriptive about the person i am inside, rather than photos that other people take of me.